"We" must have had quite a first year - using the truly Royal "we" - since it is "our universe" under discussion. Our first year was a long time ago...about 15 billion years. So, even one year out of 15 billion is close enough to a sudden starting event that the term Big Bang does seem appropriate. The generally accepted Big Bang theory actually suggests our universe began infinitesimally small in space and time...lots of energy, however! What does it mean for our universe to begin? What does it mean for Space-Time-Energy to begin? Don't expect us to answer these questions, but they are worth pondering as examples of our mysterious universe. Launched in 1989 and managed by NASA's Goddard Space Flight Center in Greenbelt, Md., COBE has uncovered evidence to support the Big Bang theory of an expanding Universe. NASA researchers determined this by measuring the spectrum of cosmic background radiation, which is the Big Bang afterglow that exists all around us. According to predictions, the background radiation should have a "blackbody" spectrum unless there were major energy releases more than a year after the explosion. COBE found this spectrum precisely as it was predicted. Technical Details and References. COBE was launched Nov. 18, 1989, from Vandenberg Air Force Base, Calif., aboard a Goddard-managed Delta rocket. Goddard manages COBE for the Office of Space Science at NASA Headquarters in Washington, D.C. COBE provided data for four years; analyses of the data is continuuing. The images were compiled from data taken between December 1989 and September 1990 by the Diffuse Infrared Background Experiment (DIRBE) on board COBE. They illustrate the steps scientists used to find the cosmic infrared background, which is a radiative fossil containing cumulative starlight which now appears in the infrared due to the cosmic redshift and by absorption and re-emission by dust in the universe since the Big Bang. 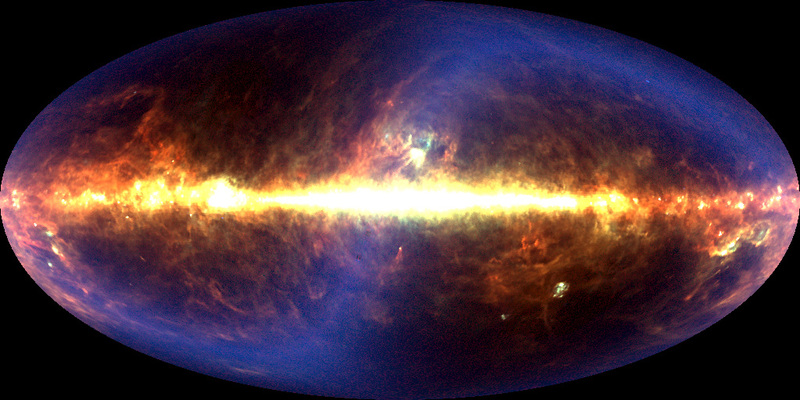 This picture represents the brightness of the full sky as seen in infrared light. 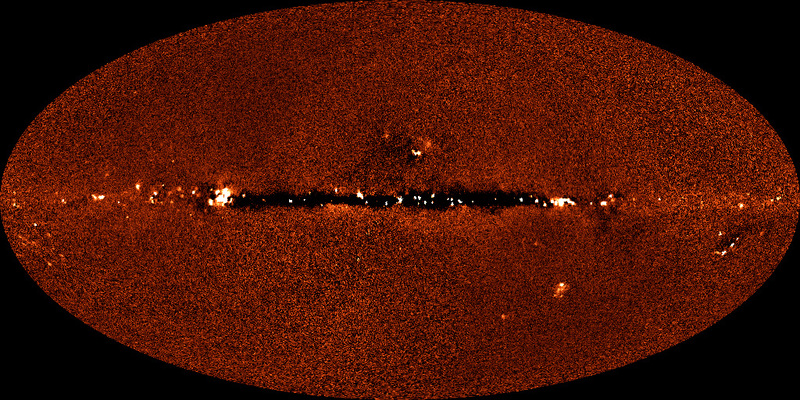 The bright yellow-orange line across the center of the image arises from interstellar dust in the plane of our Milky Way Galaxy, with the center of the Galaxy at the center of the image. 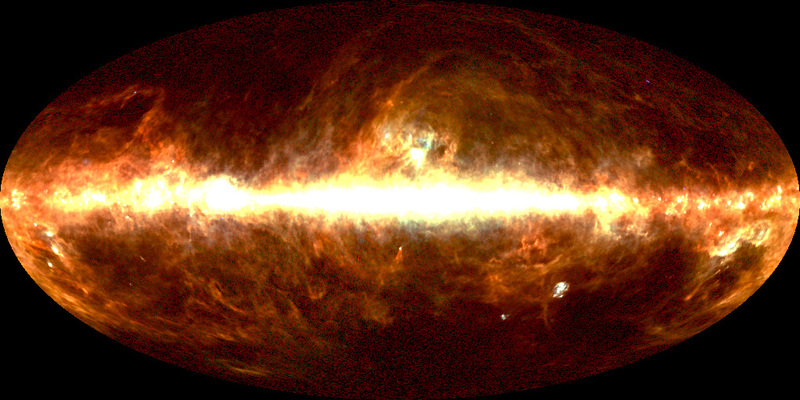 The red color above and below this line shows additional wispy clouds of interstellar dust. The blue S-shaped color arises from interplanetary dust in the solar system. A blowup of the picture is here (261 kbytes). The COBE datasets were developed by the NASA Goddard Space Flight Center under the guidance of the COBE Science Working Group and were provided by the NSSDC. NASA Press Release About the End of COBE Data Acquisition. Compiled and Edited by P-I-A. Comments and Questions to the Editor.